Since as early as the 13th century, there are paintings of the Papillon sitting on the laps of French and Spanish noblewomen. Rubens, Van Dyke and Rembrandt are just a few painters that portrayed them in various artwork. They were favorite lapdogs of court ladies throughout Europe. The early toy spaniels from which the Papillon descended had drop ears. However, at the court of Louis XIV in the 17th century, a small spaniel was developed that had upright, erect ears and was given the name Papillon, which is French for “Butterfly.” Other names the Papillon has been called throughout the years are Epagneul Nain (dwarf spaniel), Dwarf Continental Spaniels, Continental Toy Spaniel, Little Squirrel Dogs (because their plumed tail resembles that of the squirrel), Belgian Toy Spaniels, and Pap. Papillons are smart little guys who are tougher than they look. They are friendly, happy, playful, charming, and animated. Papillons can be affectionate, gentle, and patient. They want to be by your side all the time. Papillons love to cuddle, go for walks or rides, and do just about anything you are doing. They are smart and can be trained to perform small tricks. They were bred to be the perfect companion, and that’s what they are. Papillons usually weigh between 7 to 10 pounds and stand approximately 8 to 11 inches tall. They are a very small dog and have a fragile build. They are known for their beautiful “Butterfly” ears. Their coat is long and silky and is usually white with patches of a variety of color. 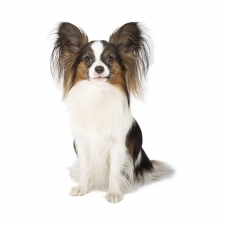 Papillons are the 25th most popular dog registered with America's Pet Registry Inc. It is said that Marie Antoinette walked to the guillotine with her little Papillon in her arms. According to legend, her little dog’s life was spared.